“A Collection inspired by the memories of the Maison Boucheron gem hunters. The nose behind this fragrance is Nathalie Lorson. Top notes are pear, mandarin orange and jasmine; middle notes are bourbon vanilla, heliotrope and peru balsam; base notes are white musk, sandalwood and patchouli. 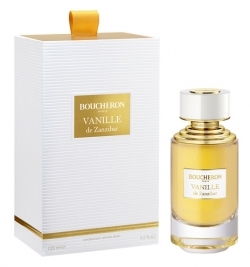 Available as a 125 ml EDP. Vanille de Zanzibar was launched in 2017.